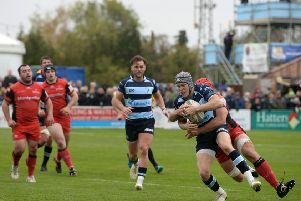 Bedford Blues fly half Steffan Jones has made the switch to play for Ampthill next season. He joins Ben Calder, of London Scottish and another former Bedford player, as they swap Championship outfits to play for the Amps in National One. Fly half Jones, born in Caerphilly, made 44 appearances for Bedford in the Championship and British & Irish Cup. Prior to joining Blues he spent four years with Newport Gwent Dragons where he played in the European Challenge Cup, Rabo Direct, LV Cup and British & Irish Cup in his 43 appearances. Jones said: “I am delighted to start a new chapter in my rugby career with Ampthill whose ethos reminds me of the clubs of my youth in Wales. Scrum half Calder made 14 appearances in the Championship and the British & Irish Cup for London Scottish. A member of Saracens Academy from the age of 12 and capped for Wales U18, he also made four appearances for Bedford Blues in the Championship and the British & Irish Cup in 2013-14. Calder said: “I am excited to join Ampthill whose ambition and recent achievements make it a leading club in National One. Head coach Turner was delighted that Stef was heading to Ampthill after a successful couple of seasons at Goldington Road, saying: : “It will be great to work with him again after a short spell at Dragons in 2010-11. “Ben has been on the radar for sometime since his Saracens days and joins with Championship experience at both London Scottish and Bedford Blues. - Bedford Blues were stunned to hear of the death of former player David Francombe. See page 11.